EXTERNAL AFFAIRS Minister Pranab Mukherjee, who visited Dera Baba Nanak today over the Kartarpur corridor, said the MEA would send a team of experts to Pakistan soon. 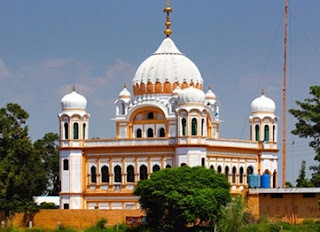 The Kartarpur gurdwara is located barely 4.5 km into Pakistan territory from the border town of Dera Baba Nanak. The corridor, if the proposal works out, may subsequently serve as a new trade route between the two countries, Pranab said. The External Affairs Minister was speaking to mediapersons in town. In reply to a question, he refuted Communist Party of India (Marxist) General Secretary Prakash Karatâ€™s charge that Prime Minister Dr Manmohan Singh was responsible for the present â€œpolitical crisisâ€ in the UPA. In defence of the PMâ€™s stand on the nuclear deal, he said the agreement would go a long way in meeting the countryâ€™s energy needs. â€œWe do not have enough quality coal,â€ he said. Besides, nuclear energy would be pollution free. Power demand will likely increase fourfold by 2020, at an estimated 8 lakh MW, for which traditional means would not suffice, said Pranab. Chief Minister Parkash Singh Badal said he had discussed the corridor issue with the External Affairs Minister yesterday and expressed his gratitude to him for visiting Dera Baba Nanak on his request, at a short notice. Speaker Nirmal Singh Kahlon, who is the local MLA, said the corridor would immensely benefit the area, a business hub before Partition.